Last week a series of these posters went up around my office. They were bright yellow reminders that the world could use a bit of kindness. 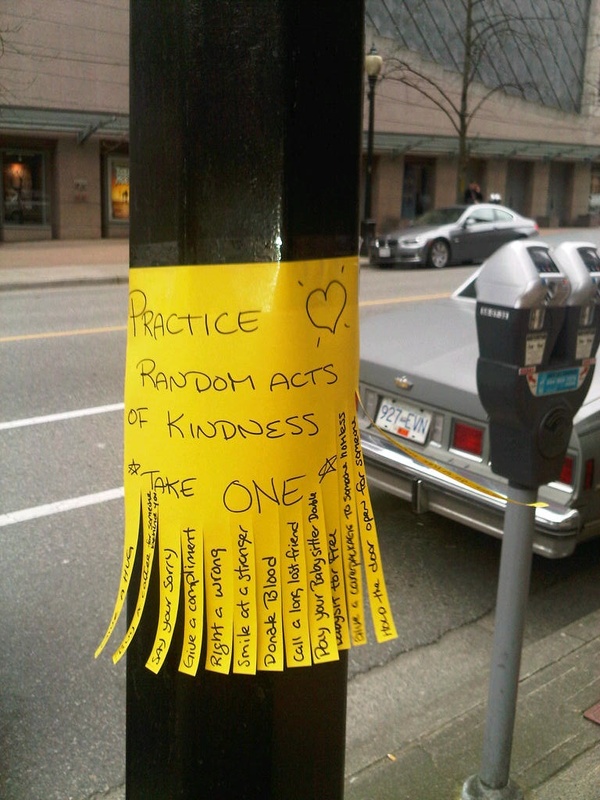 The message was simple, take a slip and perform the act of kindness listed, to brighten a day. And the most wonderful part of the day was walking by and seeing that people were taking up the challenge. Slips of paper had been ripped off. Good-job world – way to take action. These posters led me think about taking action. Many of my stories suffer from a lack of action. The driving force of the stories are in the minds of my characters and that can cause some people to criticize them as lacking in conflict. I usually disagree (conflict can be internal) but it has led me to make an effort to get out of the heads of my characters and into the realm of action. When I want to amp-up a scene I now seriously consider adding action, physical motion that my characters can be taking while I explore their internal conflicts. Sometimes this is an exciting physical confrontation, sometimes it is just a chore (doing the dishes perhaps). And usually when I make the effort I am rewarded with a scene that feels much more real. I guess that makes sense, we are all going through our daily routines while managing our internal conflicts, so why not my characters. To work the daily activities of life into the lives of our characters, we first must understand these activities. Have you even watched yourself do a chore (the dishes, the laundry, making a meal)? We all do these activities each day, but most of us do them on auto-pilot, not really paying attention to the steps. Today, choose a chore you do commonly, and once it is complete sit down and describe it to yourself. Make the effort to really feel and experience the chore, then translate those experiences to the page. Tell yourself what actions you had to take to complete the chore. Describe the steps, the equipment you used, and the mechanics of the chore. Then, describe the sensory experiences that accompanied the chore. For example, how did the laundry fell (wet and dry). What smells were in the room (is your dish detergent scented)? Are there any sound associated? Aim to write for twenty minutes. NB – This week I finished the second draft of Riveted, and sent it off to my next round of readers. Yay me! Now I can start on one of those shiny new ideas that have been running around in my head, demanding attention.